HEARTS head coach Robbie Neilson insists his current side are still miles away from being able to match the exploits of the class of 2005-06. The Jambos have carried on from last season’s Championship title-winning feat by storming to the top of the Ladbrokes Premiership table following three straight victories. 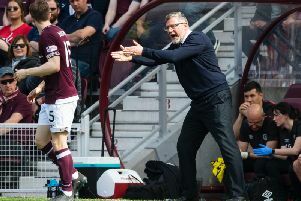 It is the first time the Tynecastle outfit have occupied top spot since former boss George Burley and his side managed it a decade ago. Neilson was part of that team and played an influential role as the Gorgie men won their first eight SPL games of the campaign. But he claims the CVs of his youngsters and his former team-mates barely stand up to comparison. “We are miles away from that team,” said the former full-back. “That was a team which had a Champions League winner [Edgaras Jankauskas, with Porto] and a European Championship winner [Takis Fyssas, with Greece] in it. “Just about every player in the squad was a full international. We’ve still got a long way to go to get near that. “Record-wise, that team won the first eight games and stayed unbeaten for another four more. If we can emulate that then great, but we’re still a long way off it. Hearts have taken care of St Johnstone, Dundee and Motherwell so far. But Neilson is concerned making it four wins out of four will be a tougher proposition when they head to the Highlands to face Ross County on Saturday. He said: “It will be difficult. It is probably our hardest game yet. We are coming off two hard games and have had only two days’ prep before travelling up to Ross County, which is the furthest we will travel. “We could only train for an hour before making the journey because we have to recover from Wednesday night.